The author is 10 time zones behind me, and I saw her message on my phone at 10 p.m., so I could not check the index until morning. I understood her to mean that the entry said only Ailurophobiopolis, 112 and replied, “Yes, it certainly should say ‘See also, Pickled Herring, Temple of’ and I thought I had it in there. I’ll have to check in the morning.” I went to bed wondering how on earth that See also cross-reference had been dropped. The day before, when I was generating the final index, the cross-references were not appearing correctly — some of them even disappeared. At the suggestion of colleagues in a forum, I looked for and removed stray coding in the cross-references, and they then appeared correctly. But had some been dropped? In the morning, I checked the document that I had sent to the author, and both Ailurophobiopolis, 112 and See also, Pickled Herring, Temple of were in the entry as they should have been. Then I saw another email from the author. She had “corrected” the index entry to this: Ailurophobiopolis, See also, Pickled Herring, Temple of. I briefly explained these in Part 1 of this series. I doubt that my author had seen that post, but in any case, readers and authors can benefit from more explanation. 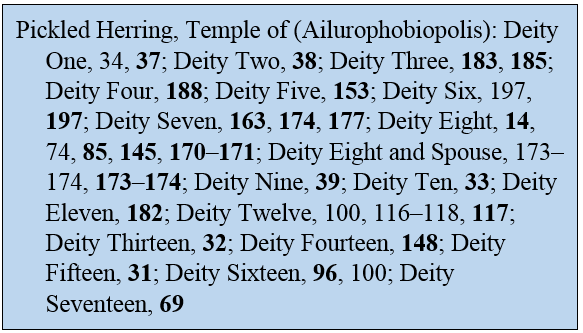 In this index (I explained to the author), Ailurophobiopolis, 112 is referring to the New Kingdom mummy of Vizier Siliwauks found at that site. But Pickled Herring, Temple of has subheadings. It cannot go under Ailurophobiopolis because there is only one level of subheading. It has to have a main heading of its own. See also tells the reader to go to the Pickled Herring Temple to find out more about Ailurophobiopolis. A total of 18 subheads and 31 locators. Yes, I am going to send the reader who looks at Ailurophobiopolis to Pickled Herring, Temple of rather than repeating all of this under Ailurophobiopolis. But if, in another case, there are only a few locators for each item, I can put all of them under the main entry. I do not need to use a cross-reference to send the reader elsewhere. Another reason for a See also cross-reference is to take the reader from something specific to a more-general topic. 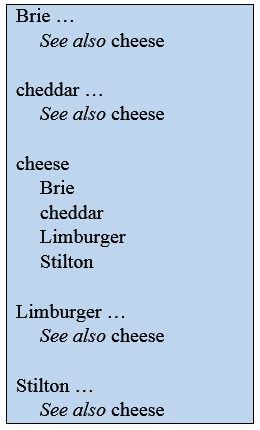 For example, the index of a book about food might have entries for different types of cheese. Each of these should have a See also to cheese. This is also an example of double posting, in which main entries are posted again as subentries under a category. A See also cross-reference can also direct the reader to one or more related entries. The metatopic might appear as an entry with multiple see also cross-references. 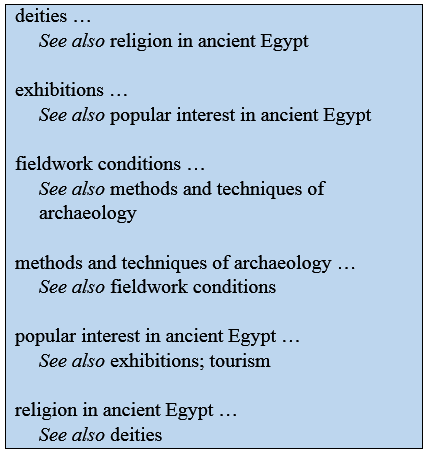 In a large history of Egyptology, I indexed the metatopic Egyptology with subentries such as definition of, disciplinary boundaries within, and other topics that would not stand on their own as main entries, and had a list of see also cross-references. Each of these was a long entry with many subentries. One final remark: Some of you may find fault with the example entries Pickled Herring, Temple of and Cynophobiopolis, which are from a run-in index. By convention, the subentries in a run-in index should be grammatically linked to the main entry, and I do normally follow that convention. However, in this case, there were a lot of entries like these — a temple or tomb with a list of deities depicted in it. The index was going to be set in 8-point type, and space was limited. Adding “in” after each deity’s name for the sake of convention was only going to waste space and make the entry more cluttered and difficult to read. An index should serve the reader; hence, I ignored convention in such entries. See also cross-references are an important indexing tool for linking concepts and guiding the reader to a book’s contents. If you have ever been bewildered by them, I hope their use is clearer now. Ælfwine, this piece of your post has a few run-together strings. What were they supposed to be? I admire your philosophy— An index should serve the reader; hence, I ignored convention in such entries. — and especially your made-up city names :-).